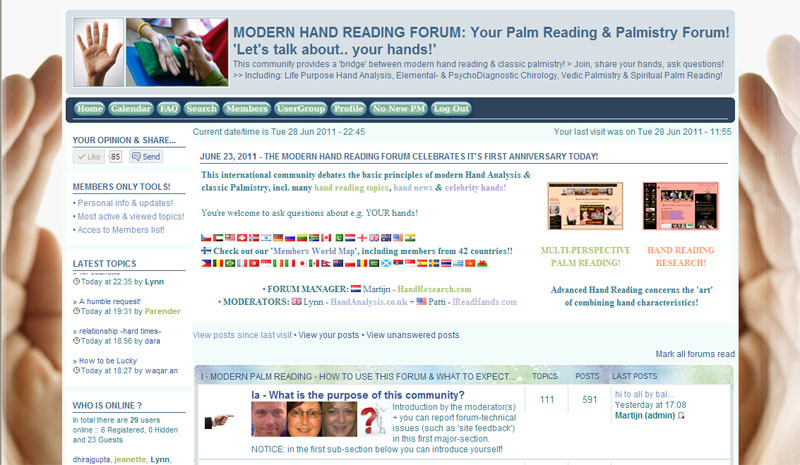 The Modern Hand Reading Forum celebrates it’s 1st Anniversary! In the summer of 2010 the ‘Modern Hand Reading Forum was founded as a place where (professional) palm reader experts, students & laymen can share their interests about hands. Last week the forum celebrates it’s first anniversary. A short overview of the developments inside the forum! With over 700 members (almost 10% are palm reading professionals) and over 500+ daily visitors the Modern Hand Reading Forum became a place where assistance & expertise is shared 24 hours a day, 7 days a week. The forum includes 40+ sub-sections, including: Questions & Answers (section II), Modern Hand Reading (section III), Hand Reading Resources (section IV), the History of Palmistry (section V), and Famous Hands (section VI). – Free assistance by some very experienced Palmistry, Hand Analysis & Chirology experts in the world! – A rich history of sources, discussions and shared palm reading materials! PS. NOTICE: You can take a look into the forum without joining; if you would like to participate in the discussions your will have to join and become a member!!! « The Sydney Line & the Simian Crease are like ‘Fraternal Twins’!